An early shot of the Emotions, from St. Petersburg. Click image to view it full screen. Tragedy brings people together. The worst of times can bring out the best in us, and nowhere is that more evident than in a local music scene, or among amateur athletes. 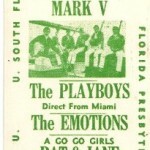 Twice, in the years 1967 and 1968, the deaths of Tampa-area high school athletes brought not only their teams together, but the local music community as well. The story starts with a record by a St. Petersburg group known as the Emotions. The fivesome chose a Zombies song (“Sometimes”) for the A-side, but it’s my opinion (and that of other garage band fanatics) that the B-side was the real gem. 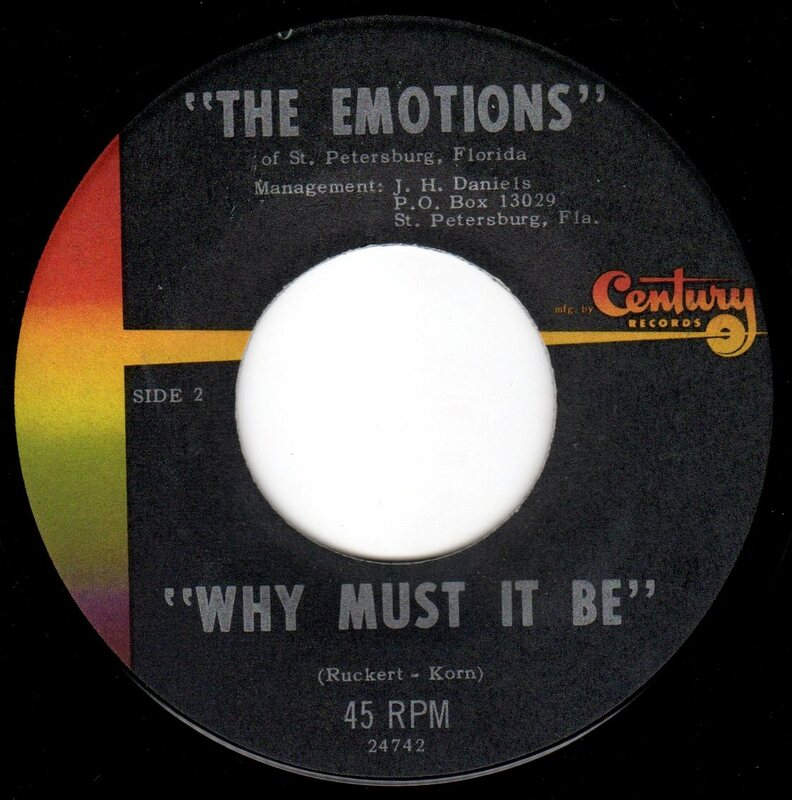 The label says “Why Must It Be” was co-written by someone named “Ruckert”, but it wasn’t group leader and guitarist Toby Ruckert. It was his brother Stuart who composed the introspective lyrics that were turned into a gem of a moody garage ballad. Living with people who just don’t care. 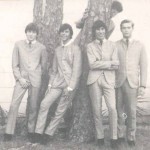 Those lyrics took on an eerie tone just a few months later, after vocalist Charlie Beauchamp joined the band (replacing original singer Mark Bass). Beauchamp, a Boca Ciega High School student, wasn’t just interested in music. He was also a three-year varsity halfback, and one of the top second basemen in Pinellas County. One Friday afternoon in April 1967, Beauchamp was manning second base, when he collided with another player and landed on his head. He underwent a tracheotomy and brain surgery, but a few days later his kidneys failed and Charlie’s life ended. On the day of the accident, Charlie learned he had received an academic scholarship from Mercer University. He was just 17 years old. If I was to die now, what would they say? Lost in the sea of humanity. Heavy lyrics, that all of a sudden hit a little close to home. The Emotions continued, with Toby Ruckert remaining the constant member of the band. 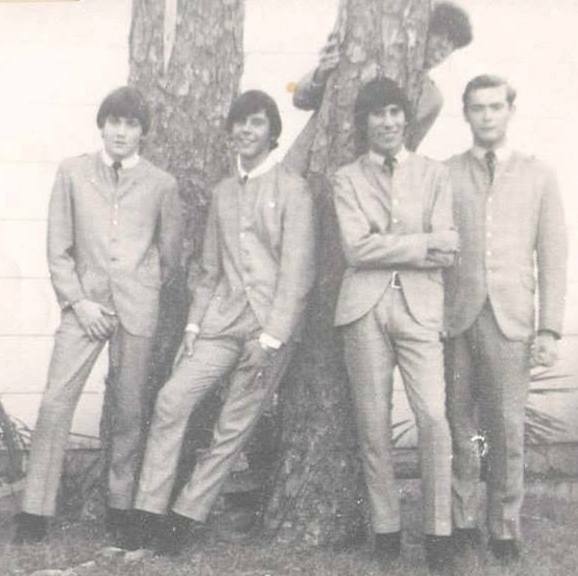 The group opened for the likes of the Turtles, Left Banke, Dave Clark Five, and Peter and Gordon, and remained popular on the local circuit. Ruckert would go on to join the well-regarded band Duckbutter, before hooking up with country star Mark Wills (among others). Beauchamp wasn’t forgotten. It took more than thirty years, but the football field at Boca Ciega was renamed in his memory, keeping his name alive for future generations. A year later. Clearwater High would also mourn the loss of a 17-year-old football star. Unlike Beauchamp’s freak accident, Frank Andrew Russell had been ill, and his death, while tragic, wasn’t completely unexpected. After the popular student passed, a memorial scholarship was set up in Russell’s name, and Clearwater student Michael Dan Ehmig — with some help from fellow high school vocalist Joe Spiewak — set out to tell his story in song. What the pair created was nothing short of brilliant, but not in the way you’d expect. You might think they’d set about to write words of comfort and solace, not a narration of his funeral! 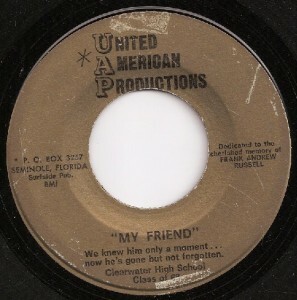 There is no other record in the world quite like “My Friend”. It defines the words “moody garage” in just about every way, but it’s the lyrics that really make this the amazing piece of vinyl that it is. “I see pretty flowers, his favorite, I hear. I see a grey coffin which no one goes near. Grab the tissues! But oh, we’re just beginning. Oh, I’m feeling so much better. Not!! I’m not out to criticize songwriter Ehmig. I think the record he created is a work of genius. It’s rarely too far from my turntable. It’s just that this must have been so painful to endure for some who knew and loved Russell. The record was about as DIY as can be: one-sided (no flip side), with no artist or writer credits. In spreading the word about this to my fellow record collectors (and the TeenBeat Mayhem! book), we had to simply refer to the artist as Clearwater High School Class of ’68. There were very few clues to go on. Thanks to Joe Spiewak, we now know that the backing band was the U.S. 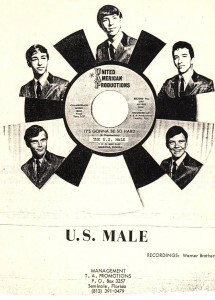 Male (aka the Uglies), who also recorded for United American Productions. The band does a good job. Everyone does. They created a piece of work that still has an impact on the few that are fortunate to have heard it. The U.S. Male, formerly known as the Uglies, provided the musical backing. The group had ties to the Impacs, Members, Roemans, and 70s hit artist Lobo. Click the image to view it full screen. Michael Dan Ehmig would go on to write and arrange for Lita Ford and Meat Loaf, and his songs have been recorded by the likes of Melanie, Joe Cocker, and Katrina & the Waves. “My Friend” is probably just a blip on his songwriting radar, but in its own way, it will endure… and so will the memory of Frank Andrew Russell. And isn’t that what it was all about, in the first place? “Men say the world’s cruel, and men say it’s mean. But my friend, he died before the age of 18. At the moment, “My Friend” is not available on YouTube. And while you’re here, check out the other posts on the Savage Lost blog.